Takko Tuesday! - Cancer - Polish Etc. 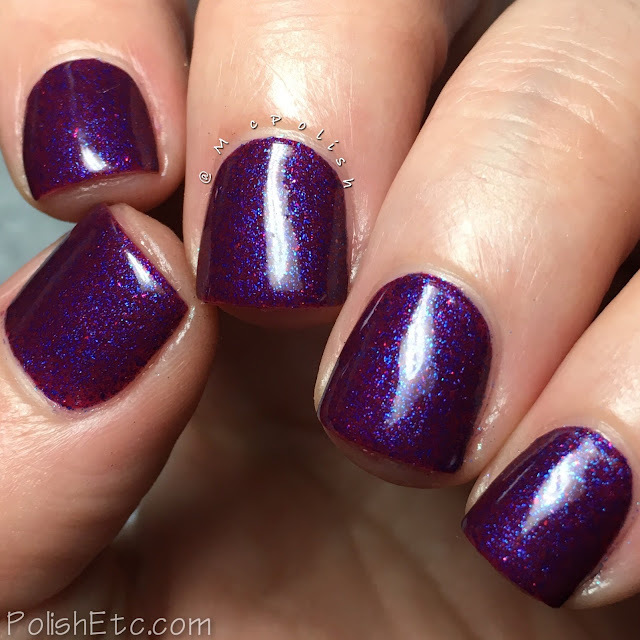 I have another new Takko Lacquer to share with you all today! On May 24th, the second trio from the Zodiac Collection will be available for preorder. And believe me, you will need this gem! “Cancer” is so so so cool looking. A great addition to the collection this year. Cancer - A deep red toned purple crelly packed with teeny tiny bright blue metallic flecks and sprinkled with tiny red flecks. The constant between the base and shimmers is amazing. I am impressed! The formula is smooth as all. I am showing you two coats with top coat here. If you don’t have fresh nuns like me, you may prefer a third coat. You can really see the little blue flecks in the macro. So very cool!